NEW !!!!!!! READY AT STORE NOW !!!!!! Continuing a long tradition of successful world-music products, Roland proudly announces the BK-5 OR, addressing the sounds of the Middle East as well as Turkey and North Africa. 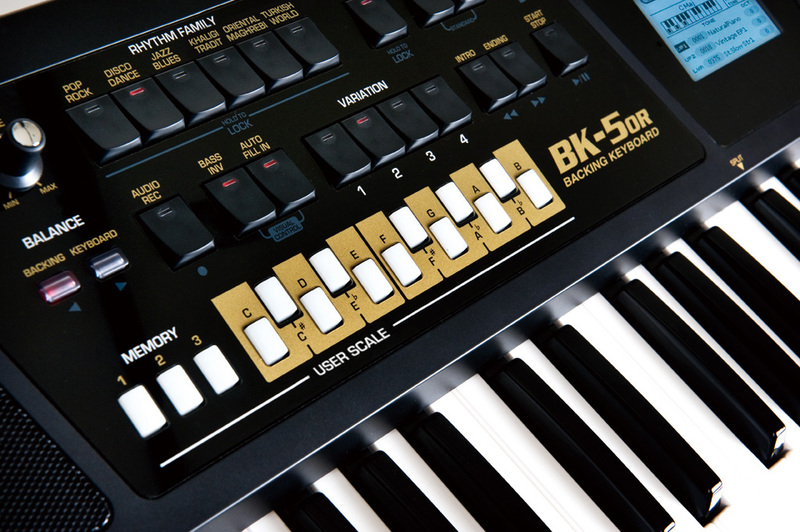 The BK-5 OR retains all characteristics and features of the recently announced BK-5 and adds newly created sounds and rhythms. * Sold exclusively in Europe and Middle East. The BK-5 OR is loaded with dozens of expressive and exotic new instruments, drum sounds, and rhythms from the Middle East, Turkey and North Africa regions. For fast and easy control of scale tunings, the BK-5 OR is equipped with 12 front-panel buttons to instantly manage each note of a scale, plus three buttons for storing/recalling the related settings. The onboard Rhythm Composer can instantly add rhythmic backing tracks to your music. Additional rhythms can be imported from USB memory. More than one drum track can be used for rhythms and SMFs. The BK-5 OR lets you record directly to a USB memory. It's a great way to listen back and evaluate your performances, and share your creations with others. 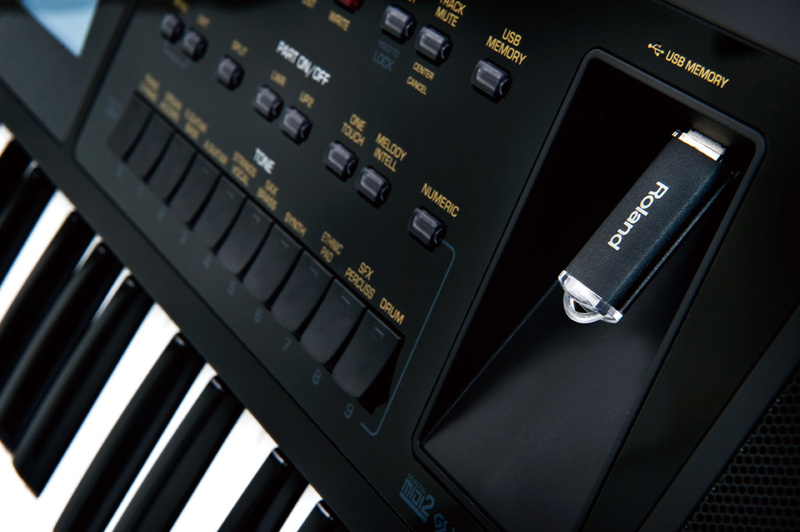 Add full backing accompaniment to your performances directly from USB Flash memory. The BK-5 OR lets you import and control rhythm files, SMFs, MP3s, and WAV files. Instant quarter-tone tuning of each note of a scale (C to B). Adjustable tuning range (–64 to +63 cent) for each button. Tunings can also be saved to Performance memories. BB1024X incorporates many of the same features found in the BB2000 series such as, spline joint body and 5-piece neck, diagonal body thru stringing, newly developed pickups and bridge. This bass gives strong presence in sound with defined low end. BB1024X has employed a 3-piece body structure with which its bridge is placed on the center piece in order to translate the maximum amount of string vibration to the body. Instead of simply gluing wood pieces, we insert a Maple plate, called "Spline", into a slot on its joint sections. By doing that, Yamaha has succeeded in obtaining as much body vibration as 1-piece body with this 3-piece body structure. In Diagonal Body Thru Stringing, strings are angled 45 degreed at the saddle to reduce the stress and secure their tension. Moreover, because the attachment area of strings to saddles is larger than conventional vertical stringing, much better transmission of vibration is obtained. Both front and rear pickups are specially invented for this particular series. Pursuing ultimate passive sound, "Open Face Pickups" are used to cope with even aggressive picking of rock players. These necks consist of Maple and Nato. It provides durability and prevents necks from warping and curling. Nickel Silver is selected for nut. It is the same material with fret wires. Unlike conventional bone or artificial ivory nut, it gives the same sound quality and feeling even when open notes are played. For any bass players it is a crucial part of well-defined low end. Taking the Si Expression 2 as a typical example, it features 24 recallable mic pre amps (32 on Si Expression 3 and 16 on Si Expression 1) plus 4 line inputs, 4 internal stereo FX returns, AES in, and a 64x64 expansion slot offering more than enough scope to use every one of the 66 input processing channels. Every input processing channel has dedicated processing for high pass filter, input delay, gate, compressor and four band EQ whilst keeping it under control is a comprehensive automation system augmented with four mute groups and FaderGlow™ to light the way so you are never lost. Flexible onboard and expansion I/O options ensure your Si Expression integrates effortlessly with other system components utilising any of the Si series option cards including AES, Firewire/USB/ADAT*1, AVIOM™, CobraNet™, BSS Digital Audio Bus (BLU Link)*1, Dante™*1 CAT5 or optical MADI. 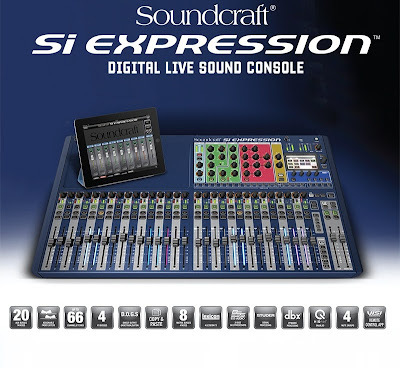 The MADI card, as well as being an interface to multi-track recording systems or plug-in systems like Waves, enables linking the Si Expression to any of the Soundcraft or Studer stageboxes to extend the I/O power and flexibility. Adding a stagebox to an Si Expression actually increases the number of channels you can mix at once not just how many inputs you have available to choose from! 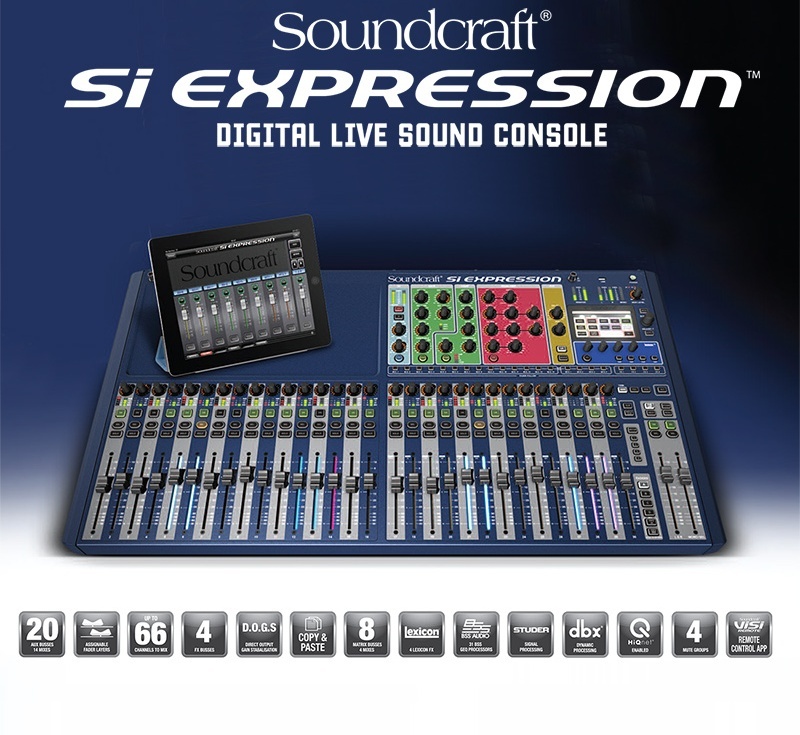 It is said ‘Power is nothing without control’ and here the Si Expression excels with a comprehensive but 'simple to use' control surface incorporating a dedicated control for every parameter, a row of global mode encoders and colour touch screen ensuring operation is quick and easy. • D.O.G.S. (Direct Out Gain Stabiliser) – Prevents manual change of a mic gain control affecting direct out levels, perfect when 2 consoles share a stagebox or when recording the channel direct outputs. • Security Lockout – Lock the whole console or just selected elements, manage the security with the users and profile settings. • Copy & Paste – Copy whole channels, busses, mixes, Lexicon™ effects, a single part such as the EQ or multiple parts like the channel gate and compressor. • Personal Monitoring Interface – When used with the Si BLU link option card, the Si Expression is a perfect partner to the dbx PMC16 Personal Monitoring System , using simple Cat5 cabling for easy setup. • TOTEM™ – The One Touch Easy Mix; press a single key to mix to an AUX, FX or Matrix bus, the surface and monitoring instantly reconfigure to allow instant mixing to your chosen bus on the faders. • BSS® GEQ – With a BSS GEQ on every bus there is never any need to assign from a pool of resources and you will never 'run out' of processing. • 1 Control = 1 Function – With each control dedicated to a given function there is never any 'layering' of controls or navigating through screens; this allows the Si Expression controls to be labelled on the surface just as they would have been on an analogue mixer. • Everything Everywhere – All channels and busses have a full complement of processing, nothing to assign or configure.